ASTANA – A new political doctrine was adopted and strategies and responsibilities for the coming decades were laid out during the Oct. 18 15th Congress of the Nur Otan party under the chairmanship of party leader, Kazakhstan President Nursultan Nazarbayev. During the Nur Otan congress President Nazarbayev presented his vision for the party’s leadership in the 21st century and emphasized its role in the successful implementation of the Strategy 2050. The new political doctrine, “Nur Otan. Creating the Future,” which was developed to consolidate party values and define the party’s mission, was approved unanimously through a popular vote at the congress. First Deputy Chairman Bauyrzhan Baibek noted that the doctrine was developed at the president’s instruction. The draft doctrine was discussed for about two months at all levels of the party, from political council to local organisations. The core of the strategy is the objective of Kazakhstan becoming one of the 30 most developed nations of the world. “Having declared independence we forever left the periphery of development and became a new, deserving state of Eurasia. And now we must always keep pace with the world community,” said Nazarbayev. 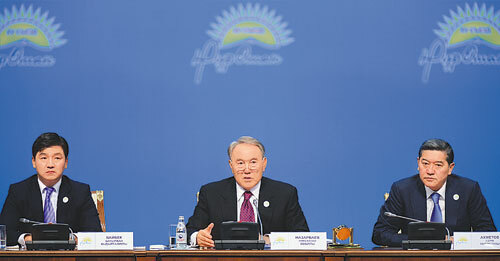 Nazarbayev also presented his vision for the party’s leadership in the 21st century. He stressed that Nur Otan’s mission is to become the national centre for the formation of a new Kazakhstan patriotism, as declared in Strategy 2050. The party must remain the central link of national unity, he said, and therefore bears great responsibility. Nazarbayev said Nur Otan should become a national source of economic and social innovation. He noted that the party’s main slogan “Alga Kazakhstan!” (“Go ahead Kazakhstan!”) takes on a heightened meaning in the context of Strategy 2050. Nazarbayev listed the successes Kazakhstan has had so far. By the end of this year, a 6 percent growth in GDP is forecast, higher than last year and despite the volatility in global markets, he emphasised. Agriculture is growing and the country has accumulated more than $90 billion in foreign currency reserves as a cushion against future global economic turmoil, he said. Nazarbayev also noted that Kazakhstan now exports to more than 110 countries around the world and is seeing the emergence of industries the country has never had before, including the production of cars, trains and helicopters. Under the country’s programme of industrialisation, more than 250 new products have been developed in the engineering, pharmaceutical and chemical industries, Nazarbayev noted. He said the country had reason to expect success in all major indicators as the year ends and that Strategy 2050 would usher in more changes for the better. It is Nur Otan’s responsibility to lead in implementing the programme, he said. Nazarbayev also recalled the more humble ambitions of the first party congress, nearly 15 years ago, and said that thanks to the efforts of party members, the new strategy would be implemented ahead of time. He noted the work that had been done to improve the lives of Kazakhstan’s citizens, including building roads, businesses, schools, clinics, universities, libraries and cultural and sports facilities, and the hundreds of thousands of new jobs these created. At present, Nur Otan has about 900,000 members in its ranks. The party has a majority in the Mazhilis of the Parliament, which Nazarbayev called an important indicator of nationwide support. He urged members to increase their energy in their work. Only under the leadership of the Nur Otan party can Strategy 2050 be achieved, Nazarbayev said, and it will need the work of all party members. He listed a number of responsibilities for Nur Otan in coming days: to be the country’s main patriotic force, to be a force for national unity, to be a leader in civil society, to be a centre of innovation, to be a better tool of control, to focus on youth policy and to defend the nation’s foreign policy decisions. To do this, the party should further develop its teamwork with the Civil Alliance, Nazarbayev said, to be a political conductor of all patriotic nongovernmental organisations’ interests. It must strengthen and expand the national coalition around Strategy 2050. The party should also focus on its creativity and increase its interaction with the creative classes, and make more use of parliamentary and public supervision of the execution of Strategy 2050. The president revisited the need to levy indirect luxury taxes on luxury estates, luxury cars and luxury articles, including alcohol and tobacco products, calling it a civil and patriotic position. He said that as the number of wealthy people in the country grows, they should contribute to the cause of social justice and that this was a global practice. He also called the party to expose and fight bribe-takers and corruption. Baibek, on behalf of the members of the party, expressed confidence the party will rally the nation in order to achieve the goals assigned by the head of state. Senator, Honoured Art Worker and Chairman of the Union of Writers of Kazakhstan Nurlan Orazalinov highlighted three aspects of the new political doctrine in his speech. “First is a separate section which determines the values of the party: individuals, freedom, the rule of law, justice, solidarity, family and traditions. These are the sacred foundations that should be preserved and augmented. Second is that the document pays much attention to the development of the state language, the preservation of culture and spirituality and bringing together our society. Respecting other cultures, taking the best from the outside, we thereby maintain cultural identity,” he said. The third aspect, he said, is that the doctrine presents a conceptual vision of independence. Strengthening the independence of the state is not possible without the consent of people, unity and the consolidation of society. “We must live and work for the good of our country,” Orazalinov said. Member of the Mazhilis Maulen Ashimbayev discussed some aspects of the doctrine. In his view, the document raises very relevant problems. “The head of state set the strategic goal of Kazakhstan’s joining the 30 most developed countries of the world. This is, without exaggeration, a global task, requiring the concentration of all opportunities and resources, as well as a qualitatively new level of development,” he stressed. The achievement of this goal largely depends on the human factor, Kazakhstan’s people: their determination, energy and will, Ashimbayev said. 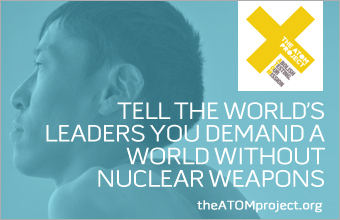 As international experience shows, global super-tasks are successfully resolved only by strong, active and ambitious nations. It is therefore very important to form a proper system of humanistic and creative values in Kazakhstan. He stressed that the essence of the document is that it clearly defines the ideological outlook and values of the party. “All achievements of our independence are the result of large and complex work carried out under the leadership of our president,” he said. “Therefore, support for the policy of the president is the support of formation of a strong, competitive and prosperous Kazakhstan. Only consolidating around our leader we will provide a decent life for Kazakhstan people and create prosperity in our country,” Ashimbayev summed up. The congress also addressed the issues of making changes in the party charter. In particular, it was decided to change its symbols and name “Nur Otan” was adopted as the official name while the words “people’s democratic” have now been deleted. The core of the new emblem is the logo of the fifteenth congress. It shows the rising sun with the image of a snow leopard, the top of the mountain and a stylised inscription of the party’s name. The rising sun symbolises future achievements and victories, the mountain high goals and aspirations for the future, and the snow leopard independence, strength and nobility, said the first deputy chairman of the party. The inscription of the party’s name symbolises the historic contribution of President Nursultan Nazarbayev to the establishment and development of the state and the party. The agenda of the congress also included issues such as changes to the Political Council of the party, as well as a number of issues relating to the functioning of audit bodies. The congress was attended by 1,200 delegates from all regional branches of the party and more than 1,000 invited guests, including heads of state agencies and national holdings, members of Parliament, representatives of nongovernmental and youth organisations, the diplomatic corps and representatives of culture and sports. After the congress, Nazarbayev held an enlarged meeting of the Political Council’s bureau with the participation of members of government and heads of regional branches. The president gave specific instructions on increasing the efficiency of the party’s activity.